Can Brussels sprouts be edible? Clearly I'm NOT a fan. I've too often seen them served hard as bullets. Supposedly they're "like a little cabbage", but there's a strong flavor that I can't quite get past. Here's the best recipe I've managed to find. Preheat oven to 425° and line a large baking sheet with parchment paper. Prepare an ice bath in a large bowl. Blanch Brussels sprouts: Bring a large pot of salted water to a boil. Add Brussels sprouts and cook until bright green and very tender, about 10 minutes. Add Brussels sprouts to ice bath to cool then drain. On a large baking sheet, toss blanched Brussels sprouts with olive oil, garlic and thyme. Using the end of a small glass or mason jar, press down on the Brussels sprouts to smash them into a flat patty. 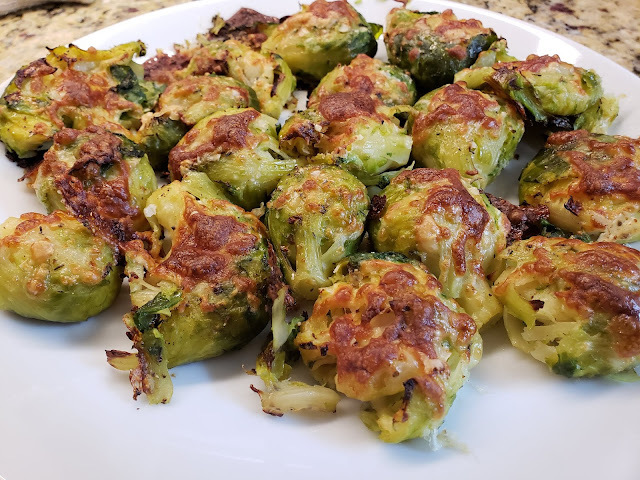 Season each smashed Brussels sprout with salt and pepper, then sprinkle mozzarella and Parmesan on top. Bake until the bottoms of the sprouts are crispy and the cheese is melted and golden, about 20 minutes.